Did you know that our brain adapts to whatever environment it is placed in? And our modern environment is vastly different from the environment in which our brain evolved. Technology has created a world unimaginable only decades ago. A world where we are constantly connected to a screen, can instantly communicate with people on the other side of the world, and have access to the entire extent of human knowledge with the click of the mouse. Technology offers us incredible opportunities but, like all things, it has a dark side too. It bombards at all times with an excess of audiovisual stimuli. It satisfies our appetite for instant gratification. And it even allows us to take on a completely different identity that gives us the confidence to be and do online what we aren’t and would never do in the real world. How is this brand new world shaping our minds? Are we becoming smarter and more efficient, or are we losing the abilities to think critically and empathize with others? 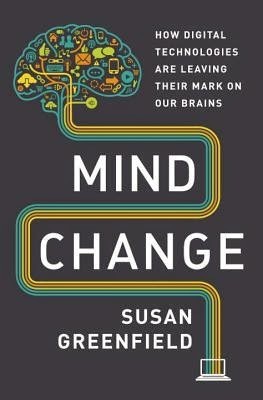 Drawing from scientific studies, news events, and cultural criticism, neuroscientist Susan Greenfield, known in her native United Kingdom for challenging conventional views, tries to answer this question in her new book, Mind Change. Mind Change is a very thought-provoking read, and a depressing one at times. Data is showing how the brain of a video gamer is similar to that of a gambling addict, how excess use of social media can reduce empathy, and how the internet, while making it easier for us to do research and look up all kinds of facts, could hinder our ability to connect the dots and gain a deeper understanding of the topic we’re studying. But it’s not all bad. Video games also help improve vision and motor control, and using tablets is a huge help for students with developmental disabilities. New apps (Greenfield proposes a few at the end of the book) could also help us fix the problems technology is causing, and help us, for instance, become even more emphatic. Still, Greenfield is negatively biased against technology. So much so, that at times it is difficult to take some of her ideas seriously. But, while I don’t agree with everything Greenfield says, I appreciate her pessimism. She may too often focus on the worst case scenarios, but, sometimes, that’s just what we need to take problems seriously and fixing them in time, so that they never become that bad. My main problem with the book, though, is the writing style. Mind Change is full of fascinating insights and interesting ideas that we all need to ponder, but the academic style doesn’t make it that accessible to casual readers. I found quite a few passages quite dry and boring, and often wished she had chosen a more engaging style. That, imo, would have helped to prompt those who need to read it the most (who undoubtedly are those who have the least interest in it) to pick up a copy. Even so, I do encourage you to check it out. Although written in an academic, sometimes dry, style, Mind Change By Susan Greenfield is a thought-provoking read full of fascinating insights about how our modern environment is shaping our minds.